How much is your time worth? Would you fill out a couple of forms that might take you 20 - 30 minutes for $230? If you will be paying college expenses one day and you pay taxes in the state of Virginia you can get that $230 every year if you want it. If you're really motivated, you might be able to fill out some additional paperwork and collect an additional $230 every time you do. Here's the deal - the Virginia 529 plan offers Virginia residents the opportunity to deduct up to $4,000 annually from their Virginia Adjusted Gross Income for each Virginia 529 plan they own and contribute to. You can deduct your contributions dollar-for-dollar up to $4,000 for each account you put money in, as long as you are also the owner of that account. The top marginal income tax rate in Virginia is 5.75%, meaning you can save $230 each time you deduct $4,000 from your Virginia AGI. Virginia also allows a carryover of any unused deduction. If you contribute $10,000 to a single account in a year you can deduct $4,000 for that tax year, $4,000 in the next tax year and $2,000 in the tax year after that. Virginia 529 plans are individual in nature, and can only have one owner. But beneficiaries - the person you intend to use the money - can have multiple accounts as long as the total of all accounts for one beneficiary remains below $350,000. Meaning...you can be the owner for an account for your child, and your spouse can be the owner of another Virginia 529 account for the same child. If you each contribute $4,000 to your respective accounts, then you can take $8,000 off the Virginia AGI on your joint state income tax return. Have two children? If you and your spouse both open an account for each child and you put $4,000 in each of those four accounts, you can deduct $16,000 from your Virginia AGI in a single year. That's a tax savings of $920 that year! Here's a nifty concept: there is no minimum time requirement for your money to be in the Virginia 529 account to qualify for the tax benefit. In other words, you can deposit the money into the Virginia 529 account, take it out a week later, and still qualify for the state income tax deduction. Just make sure you have qualifying higher education expenses (QHEE) in the amount of the 529 distribution and your tax deduction is yours to keep. There are 4 Virginia 529 programs to choose from, but the best for a short time frame is called College Wealth. You essentially open a bank account at BB&T or Union Bank & Trust and deposit the money there. Make sure you get the right forms to characterize the account as being within the Virginia 529 program. Your money sits in the bank earning higher than normal bank savings interest (1% on savings last I checked - it varies) and it's FDIC insured. There are better plans for long term Virginia 529 investing, but if you're just doing a quick turnaround for the tax deduction the bank account is the lowest risk way to go. There are several ways to get your money out of the College Wealth account, but I found the easiest is to have them send me a check. You request a withdrawal via your account on the Virginia 529 website and tell them where you want the check sent. It's not lightening fast, but it is sufficient. I requested my most recent withdrawal on August 30 and I received the check in the mail on September 8. Plenty of time to pay my son's bills at James Madison University. 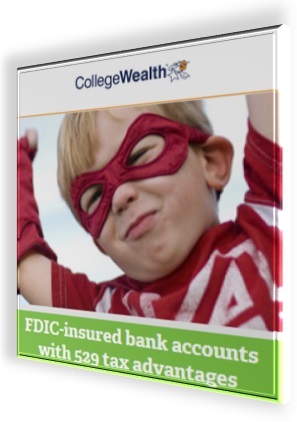 DO NOT take your money out of another 529 account and cycle it through a College Wealth account. That will count as 2 withdrawals for education. You will have to account for QHEE to cover both distributions or face the tax and penalties for an unqualified withdrawal. 529s are a great tax deduction, but if you qualify for the American Opportunity Credit or the Lifetime Learning Credit you will likely get a larger tax benefit using one of those tax credits. Make sure your use of the Virginia 529 does not interfere with your eligibility for those other more valuable tax credits for education. The good news is that unlike the AOC and LLC, you can use 529 money for room and board, so it is possible to take advantage of more than one tax break for education per student per year. You can get the AOC for the tuition expense and the 529 tax benefits for paying room and board. You just need to keep things organized and coordinated (and documented for tax purposes!). If you have any questions please contact me.